The Seller Representative Specialist (SRS) Designation was created in 2006 by three recipients of the National Association of REALTORS® Distinguished Service Award: Bruce Aydt, Adorna O. Carroll, and Steve Casper. 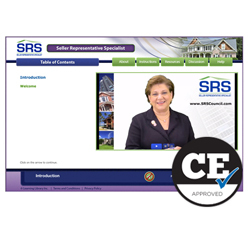 On January 2, 2014, the SRS Designation became a wholly-owned division of the CRB Council and furthers the Council’s mission of being the leader and preferred partner in providing REALTORS® with the knowledge, information, tools, and resources to maximize the success and profitability of their business. The Council of Real Estate Brokerage Managers (CRB Council) is a not-for-profit affiliate of the National Association of REALTORS®, and sets the industry standard for innovative brokerage management resources, tools and learning opportunities. For over 45 years, the Council has continued to be the guiding light for brokers, owners, managers and team leaders endeavoring to increase profitability, productivity, and performance.